Expanding on the work of Marko Rodin, Randy Powell explains vortex math and the ABHA Torus from the beginning. Randy says with Vortex-Based Mathematics we will be able to see how energy is expressing itself mathematically. This math has no anomalies and shows the dimensional shape and function of the universe as being a toroid or donut-shaped black hole. 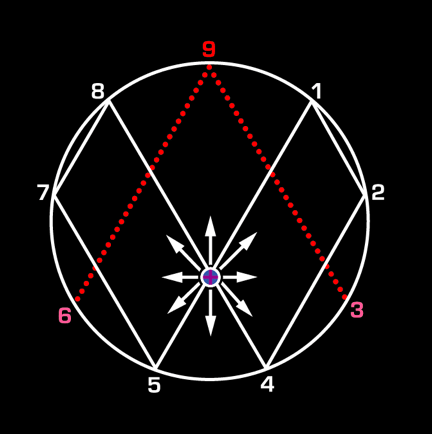 He says this is the template for the universe and it is all within our base ten decimal system. He also shares his take on black holes, God, creation and information. In the second hour, we discuss how Vortex-Based Mathematics is universally applicable in mathematics, science, biology, medicine, genetics, astronomy, chemistry, physics and computer science. Randy speculates that it could lead to incredible breakthroughs, including free energy technologies and artificial intelligence. He’ll explain how the Vortex Coil works. Later, we talk about tapping into the “9” and how math proves there is a will, a plan for us. http://www.youtube.com/user/DanielNunezMind – 59 videos as of September 29, 2012, beginning a year ago. How does the Unification Coil Work? Daniel and his wife, Erica Nunez, based out of the Bronx, New York run the 1Stop Energies business together. “What began as a ‘sustainable night light project,’ became a life long journey to reshape the way to generate and utilize electricity on a fundamental level. After closely contemplating the efficacy of solar, wind, water, and other renewable energy sources; it became apparent that these options relied on finite sources of energy and couldn’t possibly create an ‘end all’ platform for energy independence. Thus, commenced the quest to develop a type of energy generating system which could truly sustain and balance energy in a new way. We commenced by creating simple energy efficient motor/generators based on open source information attainable through internet searches. Shortly after, this led us to Vortex Based Mathematics. The entire VBM premise is based on universal ‘natural pathways’ or ‘flow paths’ that exist in the 3-d space we inhabit. After seeing other small scale models created by driven inventors and researchers; we decided to take it a step further and develop our custom framework to control and ensure geometric precision in toroidal space. We began testing different wiring algorithms and creating custom circuitry to understand and replicate our own findings for both on and off grid uses. Over the course of 4 years, we have developed enough collective knowledge to replicate our results on large and small scale uses; while posting our findings to the internet community in an attempt to raise awareness and peek interest into these wonderful new possibilities.